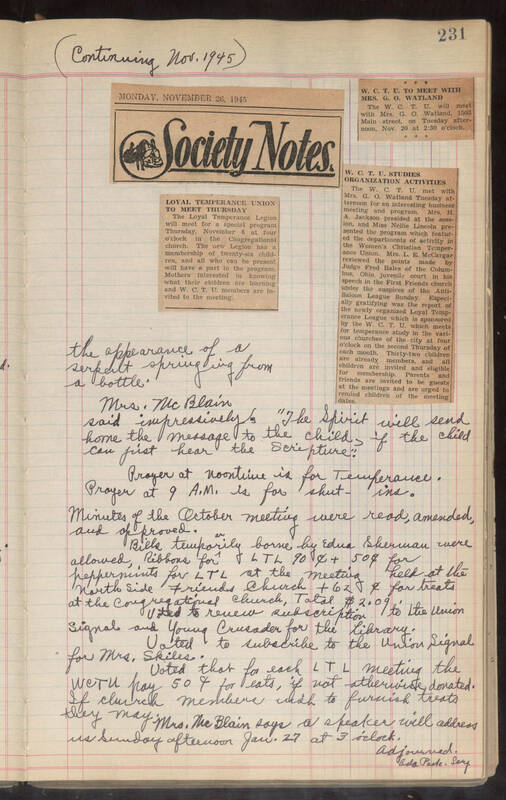 (Continuing Nov. 1945) 231 MONDAY, NOVEMBER, 26, 1945 Society Notes LOYAL TEMPERANCE UNION TO MEET THURSDAY The Loyal Temperance Legion will meet for a special program Thursday, November 8 at four o'clock in the Congregational church. The new Legion has a membership of twenty-six children, and all who can be present will have a part in the program. Mothers interested in knowing what their children are learning and W. C. T. U. members are invited to the meeting. W. C. T. U. TO MEET WITH MRS. G. O. WATLAND The W. C. T. U. will meet with Mrs. G. O. Watland, 1503 Main street, on Tuesday afternoon, Nov. 20 at 2:30 o'clock. W. C. T. U. STUDIES ORGANIZATION ACTIVITIES The W. C. T. U. met with Mrs. G. O. Watland Tuesday afternoon for an interesting business meeting and program. Mrs. H. A. Jackson presided at the session, and Miss Nellie Lincoln presented the program which featured the departments of activity in the Women's Christian Temperance Union. Mrs. L. E. McCargar reviewed the points made by Judge Fred Bales of the Columbus, Ohio juvenile court in his speech in the First Friends church under the auspices of the Anti-Saloon League Sunday. Especially gratifying was the report of the newly organized Loyal Temperance League which is sponsored by the W. C. T. U. which meets for temperance study in the various churches of the city at four o'clock on the second Thursday of each month. Thirty-two children are invited and eligible for membership. Parents and friends are invited to be guests at the meetings and are urged to remind children of the meeting dates. the appearance of a serpent springing from a bottle. Mrs. McBlain said impressively, "The Spirit will send home the message to the child, if the child can first hear the Scripture." Prayer at noontime is for Temperance. Prayer at 9 A.M. is for shutins. Minutes of the October meeting were read, amended, and approved. Bills temporarily borne by Edna Sherman were allowed, Ribbons for LTL 90¢ + 50¢ for peppermints for LTL at the meeting held at the Northside Friends Church + 62¢ for treats at the Congregational Church, Total $2.09. Voted to review subscription to the Union Signal and Young Crusader for the Library. Voted to subscribe to the Union Signal for Mrs. Skiles. Voted that or each LTL meeting the WCTU pay 50¢ for eats, if not otherwise donated. If church members wish to furnish treats they may. Mrs. McBlain says a speaker will address us Sunday afternoon Jan. 27 at 3 o'clock. Adjourned. Ada Park, Secy.